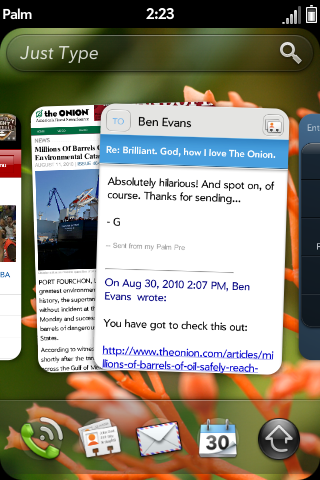 webOS 2.0 details: Stacks, Just Type, Exhibition, and more! Palm's announcements today are primarily directed toward developers, so much of what you're going to see is about frameworks and not features - the killer user-facing features will come from webOS developers and (hopefully) from Palm themselves in future announcements. There's still plenty to dig into with the above features, though, so join us after the break as we get a peek into what Palm has planned for webOS 2.0. Palm is calling Stacks "The next generation of multi-tasking." With it, Palm is extending their card multitasking metaphor to support an even greater number of tasks. The idea here is simple: When you are doing multiple things on your phone, your cards are 'stacked' together in a small fan based on their association with each other. So if you get an email, reply to it, and then go back to tap a link in the original email, those three cards would be stacked together in a small fan separated from your other card stacks. Developers won't need to do anything to enable stack functionality, instead webOS 2.0 will 'figure out' which cards should be stacked together based on activities. If you don't like how webOS groups your cards, Palm says that you'll be able to easily manage the cards in each stack and transfer a card from one stack to another. Palm is rebranding Universal Search as "Just Type" and we'll admit we're happy with the change: "Just Type" is a philosophy we've been espousing here for quite a long time and the goal here is to make that philosophy more obvious to new users. To that end, you can see in the screenshot above that Just Type now gets a permanent place on the webOS home screen. Obviously, you can "Just Type" to initiate a search, however you can also tap that search box to start a search as well. It seems to us like having a persistent search box for "Just Type" would be pretty important if, say, there happened to be some hardware that lacked a physical keyboard to start a search with. That's just us speculating here (speculating like a fox). The more exciting changes here are underneath the hood: developers can now open up their apps to Just Type searches, making them fully searchable from anywhere on the phone. Additionally, developers can create Just Type plugins for any service they can imagine - adding the ability to search specific web sites, use different search clients not built-into the OS, and more. However the most exciting addition here are Quick Actions. This is another reason to rebrand Universal Search as Just Type - because it's no longer just about search. Just Type will be able to both search and initiate actions directly from the interface. So, for example, a developer could make a "Tweet This" Just Type action so users could type a tweet and send it all from the Just Type Interface. Sending emails, text messages, adding todo items, setting alarm reminders, making appointments... we imagine pretty much any text-based action could be initiated from the Just Type screen. Quick Actions in Just Type might be the feature we're most excited about. Anybody who has experienced the power of Quicksilver on OS X knows that the ability to 'Just Type' some text and then perform any action you want with it should be pumped for this feature. There are so many possibilities here we worry that the UI could get overwhelmed with options. We've seen hints of this feature before, but Palm's making it official: apps will now be able to have a 'dock mode' for when the device is set upon a Touchstone charger. Palm is calling the feature 'Exhibition' and at least as it was described to us it's simple and straightforward: an app can register an Exhibition view that will be displayed when docked. Palm is going to create a few Exhibition views to get things started, but the idea is for developers to create things like stock apps, slideshows, clocks, and more apps that are designed to be displayed automatically while on the Touchstone. Unfortunately, only one app at a time can be displayed here - we're not in Chumby-killer territory here (not that the Chumby needs killing). While we're excited about the what can happen here, we'll admit that forcing users to pick just one Exhibition app instead of letting you switch between them seems unnecessarily limiting. We'll see how it gets implemented, but we worry this is a killer feature hobbled by over-cautious execution. Palm will obviously be tweaking their default lockscreen-timeout when on the Touchstone. We could see some interesting things happen here as developers vie to create the 'one true Exhibition app,' but in the meantime it will be a nice way to get some glanceable information from your Pre or Pixi while it's docked next to your computer or bedside. Palm was the first to get the "pull everything onto your phone" ball rolling with Synergy, which brings Exchange, Gmail, Yahoo, LinkedIn, Facebook, AOL, and a bit more into your phone and ties them all together without muddying them all up with each other. Since that time, most other smartphone makers have caught on and started offering similar features. With webOS 2.0, Palm is opening up Synergy to 3rd party developers. They'll be able to offer their own services up to Synergy - for example by tying a currently non-supported IM service directly into Messaging and contacts. Palm suspects this could be big for regional carriers where social network services not called FaceBook are more popular. However it could also be useful for a corporation looking to get non-Exchange intranets hooked up to webOS. For now, the new Synergy APIs will allow developers to hook into Contacts, Calendar, and Messaging. More webOS data types will come later. No word yet on whether or how Palm plans on tweaking the core Synergy functionality - we've been waiting for the ability to only sync selected Facebook contacts and for Twitter and Facebook to get deeper integration. Motorola borrowed ideas from Synergy, but they added "Most recent status update" throughout the OS for contacts. We think it's high time for Palm to do some borrowing of their own. Palm is standardizing on the Node.js runtime environment - a structure that should not only allow for faster data access but will also allow web developers to leverage more of the knowledge they've already built-up. Another piece of developer excitement Palm revealed during their April Developer Day conference was Mojo Core, which is also definitely coming in webOS 2.0. What Mojo Core does is allow web developers to use the frameworks they're already using with their web apps and get them going on webOS with minimal effort. Whereas previously webOS developers needed to re-factor their code to work with Palm's Mojo framework, with webOS 2.0 Mojo Core will offer the basic webOS elements like scenes, views, etc programmatically to other coding frameworks. In other words: instead of completely rewriting web apps in Mojo, web developers can utilize Mojo Core to get their existing frameworks talking webOS' language more quickly. You've probably heard of PDK apps in the context of the rich 3D games that you can get on webOS (like Angry Birds, Need for Speed, and more). "PDK" actually stands for "Plug-in Development Kit" and the idea is that it is meant to work like the Flash Plug-in on your browser: Intense native code running as a 'Plug-in' on top of standard web elements. To date, PDK apps haven't quite worked like that - the 'web' portion of most PDK apps have been little more than "PDK stuff goes here." That changes with webOS 2.0, when PDK apps are genuinely able to act as plug-ins on top of standard webOS SDK code. So developers will be able to mix both standard webOS SDK elements with native PDK code - for example having a spreadsheet app that displays a 3D chart with the PDK while showing the regular data via the SDK. Both the web-based code and the native PDK code will be able to communicate with each other in dynamic ways. Palm has made the beta for the SDK for webOS available to developers enrolled in Palm's Early Access Program. If you're the developer type that's interested in getting your hands on the webOS 2.0 SDK, you should send an email to pdc@palm.com and request access to the Early Access Program. To be eligible, you need to be both a registered developer and have an app in the Palm App Catalog. If you're already registered with the Early Access Program, all you need do is log in to the Palm Developer Center and the SDK will be there waiting for you. The Beta SDK is emulator-only for now, so developers can test out the new functionality there - when it will work on devices isn't yet clear. The above isn't an exhaustive list of what we can expect in webOS 2.0. In fact, it's mainly a list of the sorts of things that developers need to know so they can start taking advantage of the upcoming features. We hope and expect that plenty of the other features Palm talked about at their Developer Day conference - from Camera APIs to Microphone access to speedy db8 & cloud sync to the improved App Catalog - will also land with webOS 2.0. There are plenty of other webOS features - like Mojo Messaging for Push notifications that are still MIA. More importantly, with a big jump from 1.4.5 to 2.0 (not excluding the possibility of an incremental update in between), we hope that there will be more new user facing features beyond Stacks, Just Type, and Exhibition. If nothing else, updates to Email, Google Maps, Gmail support, and more are all sorely needed. However even with the features above we can see webOS 2.0 changing the way we use our device: leaving more cards open, using Just Type to initiate a huge portion of the activities we do on our phones, and the added speed and functionality promised by these back-end changes should all combine to make the release feel new again. Given that HP has joined Palm in embracing the Homebrew community, we also expect that the community of developers will find more ways to extend webOS into places it hasn't yet reached.